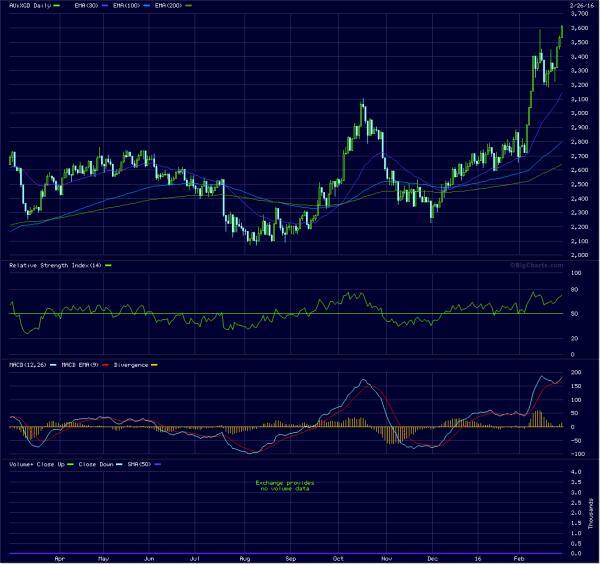 Well the ASX gold sector has had a great time lately, helped by a strong POG in AUD. It's up 72% from the Aigust 2015 low and has increased 36% in 2016 so far. Surely time for a pull-back? Looked like it was going to happen earlier this week then it strengthened again. I see volume on some of the component companies this last few days has been fairly low. New Carolin Gold is a Canadian-based junior company focused on the exploration, evaluation and development of 144 square kilometers of contiguous mineral claims, collectively known as the Ladner Gold Project. The Project is a short drive from Vancouver, British Columbia, in the prospective and under-explored Coquihalla Gold Belt and is host to several historic small gold producers including the Carolin Mine, Emancipation Mine, Pipestem Mine and numerous gold prospects. For further information and technical data on the Company and its Ladner Gold Project, please visit the Company's website at www.newcarolingold.com. Thanks for that denpal. Very interesting. In this regard it may be worth a look at EXU as a potential 10 bagger and as a dark horse (for your watch screen), another company working on increasing jorc gold, GML. He talks about the leverage, AISC levels etc and how undervalued this sector is still compared to historical norms. Reversion to mean is something that many of us would understand as 'multi-baggers on sale'! HUI is up 34% this year already, XGD.ASX is up 15% so has a lot of catching up to do. Probably a matter of nowhere else to go on terms of investment, an exhaustion of sellers, and a sentiment change. Goldies have trimmed their costs and some are doing quite well now on their margins. I think it's a combination of all of the above with a realization goldies are highly leveraged to an increasing gold price coming off ridiculous lows. Without venturing into TA territory what is the reason for the gold stocks to all of a sudden come out of hibernation? The Aussie dollar has been weakening for some time and the AUD gold price has been pretty good as well so those can't be the reason for the sudden spike. In any case from what I can tell some of the goldies operating out of Australia are also showing signs of some life. Could it just be an instance of Brownian movement and the doldrums will return soon enough? BLK also up a similar amount.